This step involves splitting and smoothing 3 legs, then drying the legs unless one uses already dry wood for the legs. 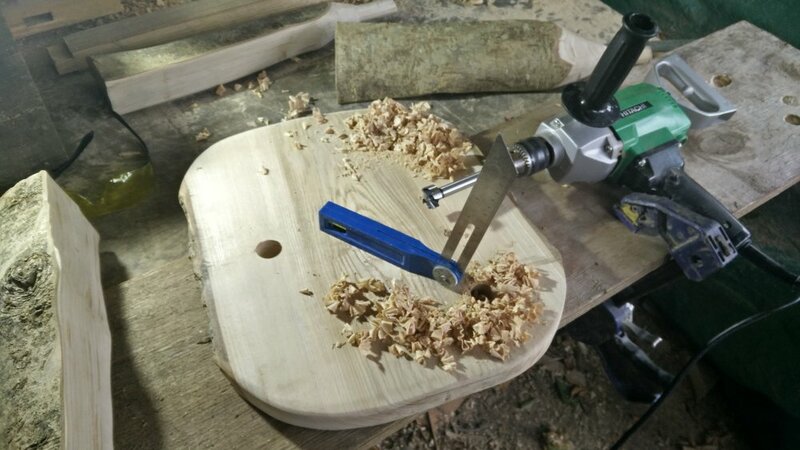 The wood must be dry because once the 1” tennons are cut on the end of them using the electric drill and tenon cutter (a tool like a giant pencil sharpener) there must be no shrinkage which would affect their jointing into the stool top. Insert the legs into the holes you drilled into the stool top. Mark a line accross the top of the tenon crossways to the grain of the stool top. 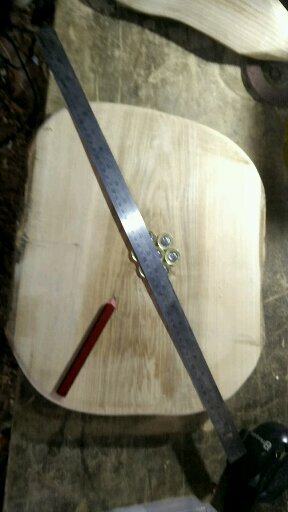 Now cut down this line the depth of the stool top depth. 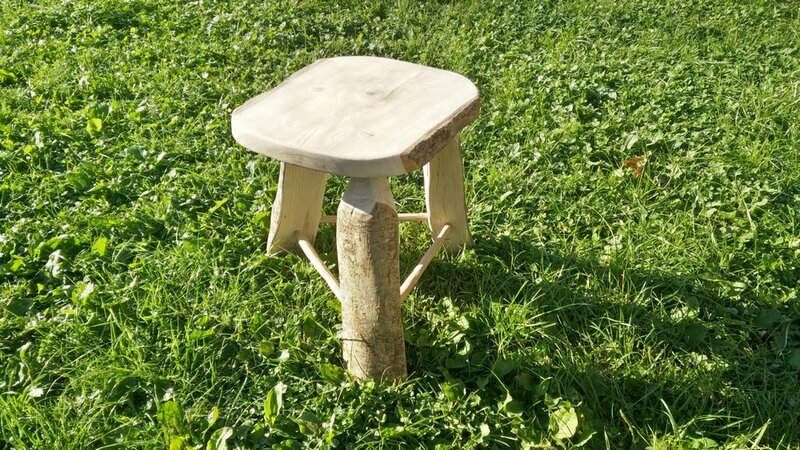 Now as if by magic the stool will appear perfect and finished! What I didnt show was fitting stretchers and wedging the legs into the stool top. This is quite an involved process and I got so caught up in it I didnt take any photos. Next time! I made this spoon during Jesiah's coming of age ceremony at Bowden House Community where I live. I love to carve a gift during a ceremony, it feels like the gift then contains the day as a memory in itself. Lawrie hitting the leg wedges home with the back of an axe. Yes its 2am! 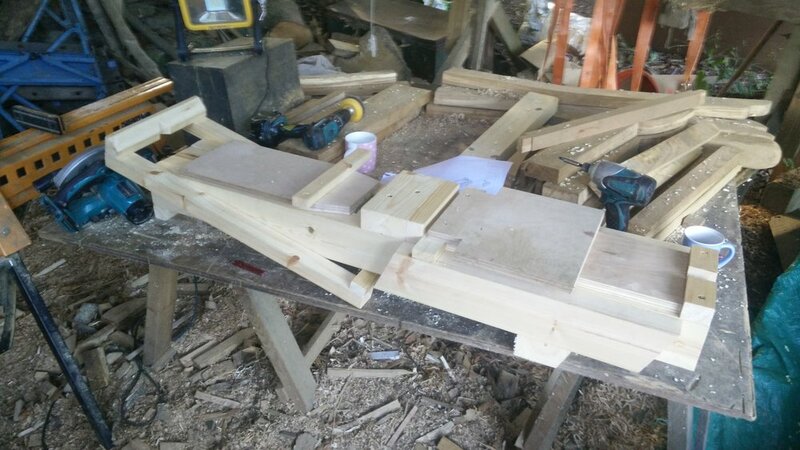 Today I guided conservation volunteers Ellie and Bryony to make 3 gates from split sweet chestnut. It was a great fun day and we are thrilled with the results! I have a write up in the Jan 20th edition of the Totnes Times! Chainsw sharpening article in print! I am in print, in a magazine called country smallholding (www.countrysmallholding.com)! This Week I have been putting the finishing touches to this chair, in ash with holly arms. This is the workshop I am working in at Bowden House Community near Totnes, where I have also bought a house. This log is 3 years old, very gnarly and hard, but beautifully complex inside so well worth resharpening the chain a few times! I start off by using the vertical milling attachment to take off one side to even it up. Next I clamp the chainsaw in the horizontal Alaskan Mill attachment and slice the planks off one by one. note I have previously cut a flat horizontal face on top of the log to make this possible. I've just finished making these trophies which will be awarded to the winners of the open and novice Devon hedge competitions. I was thrilled to be asked to do this because I have learned a lot of new skills through making them, and because hedge laying is very close to my heart. Although I don't take part in the competitions its great to think of the winners taking the billhook trophies home with them and feeling proud of their achievement. My gran gave me a golf trolley to which I have taken to strapping planks to. This is a real back-saver, I hope you are as excited as me about this! Straight sided planks at last! I take a first cut on the log with the horizontal Alaskan chainsaw mill, then I use this flat surface to attach the guide board to. The mini mill then runs on this guide, cutting vertically. 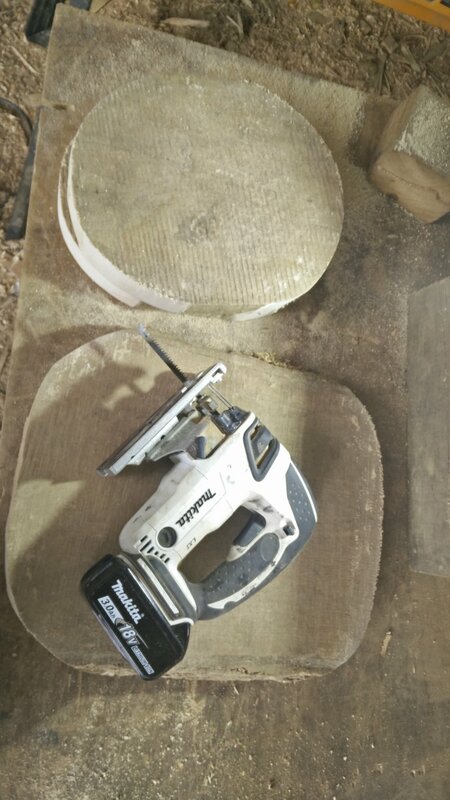 This allows me to square off the sides and produce dimensional timber, as well as quarter sawing to produce more stable timber, so very excited! I've just returned from Dowland country fair where I was selling furniture. Having finished the shelter in the photo (a Mike Abbott design) the night before, here I am enjoying a nice sit down! I had the most successful show yet, which I put down to having my own space and coherent image. Now I look more professional maybe. The wood of the shelter is ash split from larger trunks, and smoothed in the same way in which I make my furniture. So lots of work, but it paid off. Cheers! I was tree felling today because it is getting towards the time when the sap is rising in the trees. 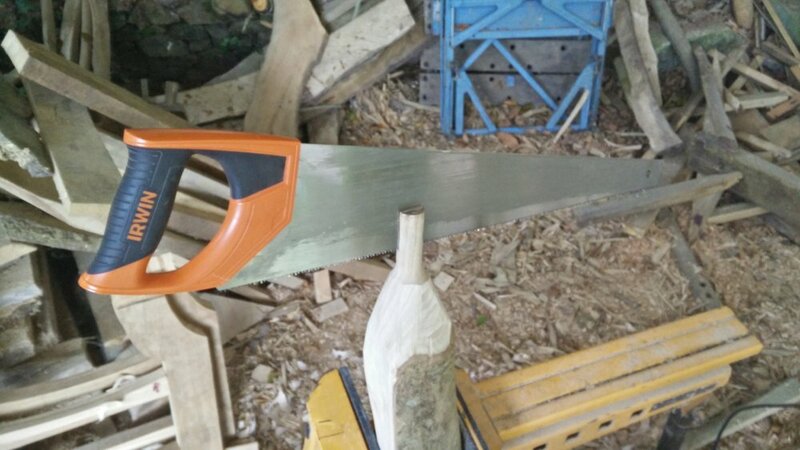 The presence of the sap in the eventual timber means that the durability of the timber is diminished, so I cut down the trees I am hoping to make planks from this summer. Cutting a biggish holly with the trusty Stihl ms.201. Holly is an amazing white, dense wood which takes shape very well. I'm hoping to make a few chairs out of holly soon, I think they will be beautiful. I feel very lucky to have access to holly wood of this size, and to work in the amazing woodland where they grow. The holly tree grew very much interlocked with its neighbouring oak tree, so I had to use the winch to pull them apart. Their intertwining reminded me of the equinox mythology. The oak king and the holly king do battle on the longest and on the shortest day. The outcome is that the holly (evergreen) king rules in the winter, and the oak (deciduous) king rules in the summer. This is certainly the case here, where the oak remains to grow on this summer, and the holly (eventually!) falls. However, the holly I have cut down today will coppice, so that the summer regrowth will do battle with the oak king and reign supreme in the wintertime again. Woods work on such a long time scale, and there is always such resurgence. My hope in this woodland is to make small changes to the advantage of the whole wood, so that it remains healthy for the future.